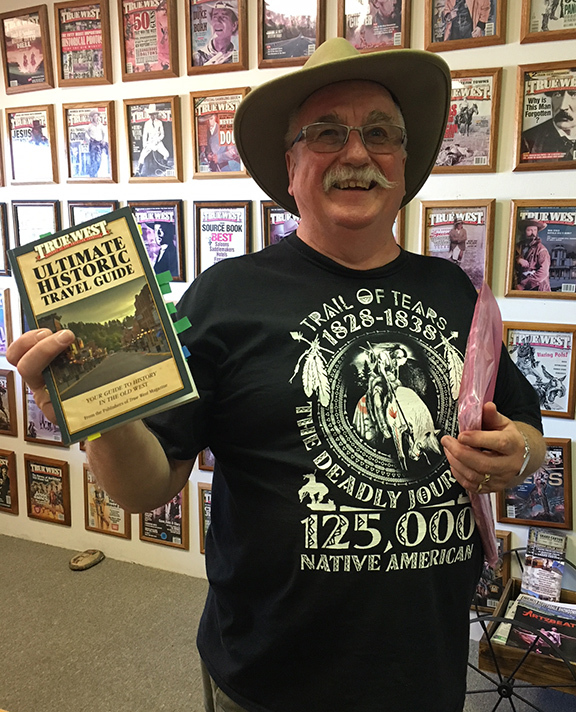 We get quite a few visitors these days at The True West World Headquarters and it's always a thrill to see our readers and talk to them about what they love about the magazine and what they'd like to see more of. Our New Zealand friend is on a 38-day trip to see the American West and he says, "This book is the best bit of research material I had for the trip." Les told me he flew into San Francisco from his home in New Zealand (a 14-hour-flight!) and then he rented a car and, utilizing the Ultimate Historic Travel Guide, he took off to the California Gold Country, with stops in Columbia and Jamestown, then over to Donner Pass and Virginia City, Austin and Ely, Nevada. Then on to Salt Lake City, Vernal, the site of Beecher's Island fight, Denver, La Junta and Bent's Fort, then on to Fort Garland, over Wolf's Creek Pass ("absolutely Godsmacking! "), Durango, Silverton, Mesa Verde, Santa Fe, Grants, Mal Pais and El Moro Rock, Show Low, Tucson, San Xavier, Bisbee, Tombstone ("They emptied my wallet! "), Arizona Sonoran Desert Museum and then the True West World Headquarters. Les told us we were the half-way point on his epic journey, and he went out the door with a rip and a snort, as we all stood on the front porch and watched him heading west into the sunset. "I always read the last page of a book first so that if I die before I finish I'll know how it turned out." The expression is " gobsmacked ".